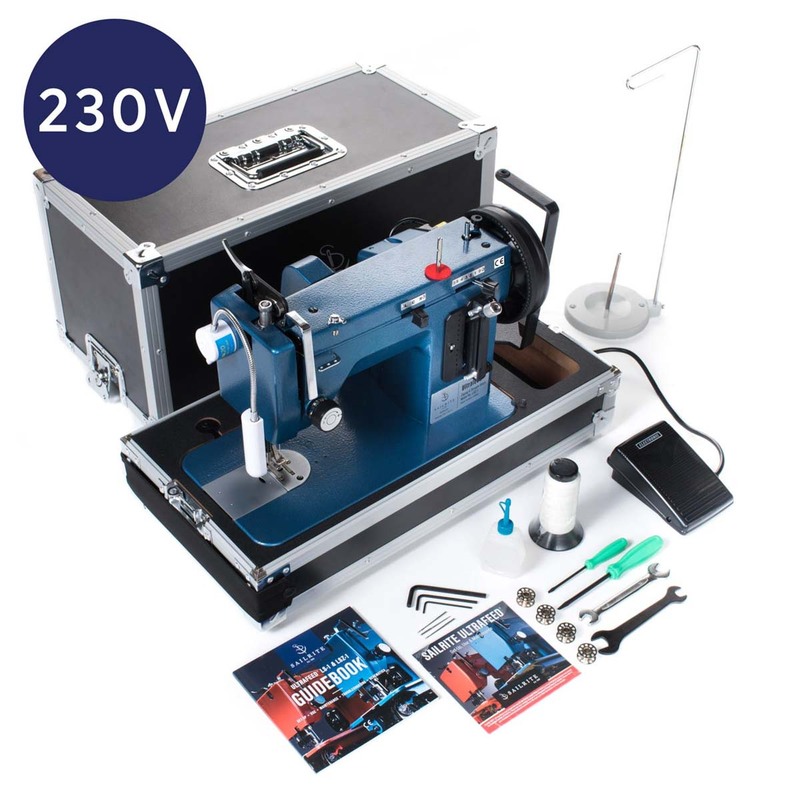 The Sailrite Ultrafeed LSZ-1 PLUS (220–240V/50 Hz) Sewing Machine package features our powerful, portable, straight stitch/zigzag walking foot sewing machine with some of our favorite accessories. This package is perfect for someone who needs an easily portable, heavy-duty machine or for boat owners looking to sew heavy canvas or sails. The Ultrafeed LSZ-1 Sewing Machine excels in performance and versatility, sewing in both straight and zigzag stitches. Built with the toughest, most reliable parts, the Ultrafeed is designed to make sewing through heavy materials like sailcloth, heavy canvas, denim, and upholstery fabrics easy (tried and true in up to 10 layers of heavy canvas and 8 layers of Dacron sailcloth). Included with the Ultrafeed is the Power Plus Balance Wheel, which has twice the power and size of a traditional flywheel for more slow speed power and control. Turning that wheel and powering the machine is a 220–240 VAC motor (6600/6000 rpm at 1.5 amps) and a cogged belt and pulley drive system. Operate using the fully grounded, variable speed, electronic foot control with 2-pin European plug. Sailrite’s patented Posi-Pin (#7438009) Clutching System provides 100% power transfer from the balance wheel to the needle. This unique system keeps the clutch from slipping while sewing heavy, hard to penetrate fabrics. An extra wide (19mm) zigzag mechanical walking presser foot works with the feed dog to pull thick layers of fabric through the machine at consistent speeds for symmetrical stitching, in both forward and reverse. The presser foot features a built-in welting tunnel for sewing piping and a needle positioning lever moves the needle left, right and center so you can sew marine zippers without changing the foot. The EZ Set Stitch Length Plate helps to keep stitch length consistent when switching from forward to reverse. Switching directions is made quick and easy by the spring loaded stitch length lever. The Ultrafeed is built to be tough enough to go wherever you go. Move it around your home, or take it in your boat or RV! The heavy-duty Industrial Carrying Case is a durable, reinforced carrying case that protects your machine so you can sew and store it anywhere. The Integrated Thread Stand attaches directly to the case’s base and swivels for convenient use and quick storage. Included with the Industrial Carrying Case is our Elastic Protector Strap. This courtesy add-on helps to protect delicate fabrics and clear vinyl from snagging or scratching on the latches of the case. The strap snaps directly onto the case via pre-install snaps. Drapery material and many more! If you will be sewing larger sails for boats up to 35 feet, you’ll need to apply a few special settings to your Utlrafeed LSZ-1 to avoid needle breaks. We recommend using V-92 polyester thread for your sails and using a #22 SD1 needle when sewing corner patches. Be sure to also increase your upper tension and sew slowly. Each Ultrafeed LSZ-1 comes with an in-depth guidebook that outlines set-up and use, threading, lubrication, home sewing, general troubleshooting, and detailed parts schematics, as well as an instructional DVD to accompany the text. V-92 White Polyester Thread 1 oz. Copyright © Ghim Soon Machinery Pte Ltd. All Rights Reserved. Website by Creative eWorld Pte Ltd.